Hynd, Douglas: Is peace as interesting as war? Towards the conclusion of Judith Brett’s fascinating biography of Alfred Deakin, the author notes how quickly the nation-building moment of Federation – to which Deakin had devoted himself so wholeheartedly – was pushed aside from popular memory and esteem by the myth-laden rebirth of Australia as a nation at Anzac Cove and on the Western Front. How, she asked, could an achievement of peaceful political change compare in popular imagination with the glory of battle? Brett’s question continues to haunt those who assess war as not glorious, but rather a testimony to a profound failure of the human imagination. But to make this point is to acknowledge a gap that needs to be filled. The struggle for peace needs to be told in stories that both engage our imagination and lay a moral claim on us to practise alternative responses that build human community. That is not an easy task, particularly considering the funding provided by governments to enable the storytellers of war to churn out yet more volumes and DVDs that lay out the necessity and glory of war as something beyond question. A couple of recent volumes from New Zealand provide us with small examples of what needs to be done as a response to such a challenge. I recently reviewed for Honest History the anthology Saints and Stirrers: Christianity, Conflict and Peacemaking in New Zealand, 1814-1945, edited by Geoffrey Troughton. That book explored the peace tradition in New Zealand from European settlement through to World War II. The essays in the Troughton book, though generally accessible in style, were written with an academic audience in mind, with commensurate attention to historical evidence and interpretation. They nevertheless provided some engaging narratives of individuals and communities that courageously said no to an otherwise monolithic demand that they participate without reservation in war. The line between stirrers and saints was fascinatingly hard to draw. More recently, Troughton has joined Philip Fountain to edit Pursuing Peace in Godzone: Christianity and the Peace Tradition in New Zealand, an anthology that takes up the challenge of presenting accessible and engaging contemporary stories about the pursuit of peace. The book is consciously directed at students in late high school and undergraduates, rather than at an academic audience. It is accompanied by online supplementary materials for use in study programs. A website provides filmed interviews with many of the authors. Taken together, the book is a helpful resource for courses dealing with social change, ethical issues, church and society, and the role of religion in New Zealand. 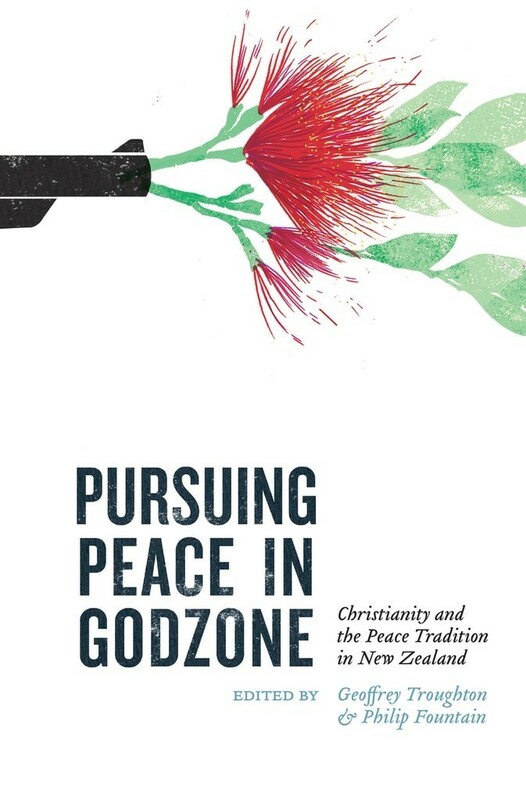 Pursuing Peace in Godzone picks up the theme of peacemaking where Saints and Stirrers left off, at World War II, and takes us through to the first decade of this century. Tom Noakes-Duncan’s account of the opposition to war offered by Ormond Burton and Archie Barrington in World War II is a point of connection between the two volumes. The narratives are bookended by an editorial introduction and an afterword by the editors reflecting on the Christian peace tradition in New Zealand, asking whether such a tradition exists, and how it might best be characterised. The final chapter, by Chris Marshall, ‘Remembering Jesus on Anzac Day, Just War or just another war?’, while starting with the phenomenon of the emergence of Anzac Day as a form of civil religion, then moves into a normative theological account of a Christian commitment to peacemaking. Most of the articles in this anthology on Christian peacemaking were written by people actively involved in the events and projects they are reporting on. You are brought up close to the action. In a number of the narratives this eyewitness involvement is both emotionally moving and personally confronting. The narrative of the Catholic Worker protest against the New Zealand intelligence-gathering facility at Waihopai has all the elements that would make a good episode of a TV drama, balancing uneasily as it does between moral seriousness and narrative tension: would they succeed in penetrating the base? The scope of activities that fall within the conception of peacemaking in Pursuing Peace is wider than in Saints and Stirrers: the latter had an almost exclusive focus on opposition to war and the relationship between the churches and government. Pursuing Peace has a fuller conception of peace as community wellbeing captured by the Hebrew term shalom; this conception seems to have shaped the choice of topics. Ecological responsibility, reforming the institutional structure of the Anglican Church to acknowledge the place of Māori, building communities of inclusion within migrant churches, the significance of overseas missions in the transition from colonialism, and community building with youth in marginal communities all get a guernsey. This breadth of vision of peacemaking is perhaps not fully picked up in the social survey chapter dealing with evidence on New Zealand Christian attitudes to war, immigration and personal freedom. In reflecting on this anthology I found myself disappointed – as I was after reading its predecessor Saints and Stirrers – that we do not have a similar volume on Christian peace activism in Australia. The story of this tradition has not yet been told. Its existence is opaque to many in the churches, let alone to the wider community, where there is a strong impression that the Christian churches are co-extensive in their social attitudes with conservative and neo-liberal culture warriors. My suspicion is that in any exploration of the traditions that have shaped the fragmentary peace witness in Australia that Martin Luther King and the civil rights movement in the United States would show up as a significant influence. The overlaps and differences that might emerge between Christian peacemaking in Australia and New Zealand would be a further topic for research. Certainly, I was struck by the absence in this Kiwi anthology of any narratives relating to Christian opposition to the Vietnam War. In Australia, there was a strong strand of opposition within some of the churches and a fierce debate over conscientious objection, a debate provoked at least partly by conscription for that war. * Dr Douglas Hynd is Adjunct Research Fellow, Australian Centre for Christianity and Culture. Apart from his review of Saints and Stirrers, he has written a number of articles for Honest History on the links between commemoration and religion. Use our Search engine.